First, let me tell you something really interesting about healthy snacks for kids. You see, most adults will be of the opinion that snacking in between meals is a serious no-no. However, according to recent research and nutritional experts, snacks are not only okay for children, they are actually pretty important: The right kinds of snacks may not only boost your child's mood and regulate their blood sugar level, but they are also excellent brain boosters in terms of significantly improving concentration skills and learning ability. So yes, snacking is a good thing ... a really good thing actually ... as long as the snacks are made of healthy foods! However, creating healthy nutritious snack foods from scratch at home may seem like a challenging task to you. Not to mention all the fancy ingredients that you imagine that you need to acquire. But fret not. The healthy kids snack recipes that I'm about to share with you are extremely simple and easy, and most likely you probably have most of the ingredients in your house already. 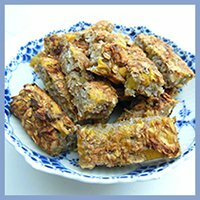 On this page you'll get recipes for many, many simple-to-do homemade sugar free snacks as well as interesting science-based facts about snacks and healthy eating for kids. Easy Snack Recipes for Kids: Curiously Crunchy Bananas, Fabulous Funny Face, Ant Logs and Cool Kiddie Kebabs. 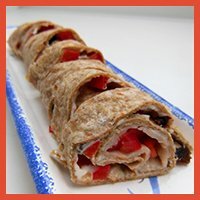 Snacks for Kids on the Move: Clever Kids Mix, Funky and Fancy Sandwiches and Roll up, Roll up, Crunchy Crispy Chickpeas. Easy Healthy Dinner Ideas for Kids: Good Old Fashioned Meatballs and Spaghetti. 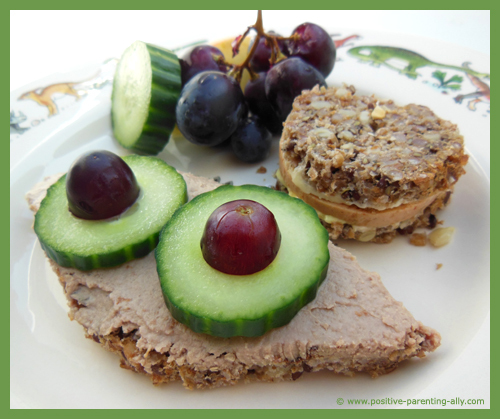 The easiest healthy snacks for kids I have found are those the kids find interesting and fun. You don't have to go overboard and make a full on salad every day, just a little thinking outside the box can make something out of the ordinary - something extraordinary! This snack is soooo easy to do, kids love it, and it really doesn't get any healthier as it is pure fruit and nothing else. 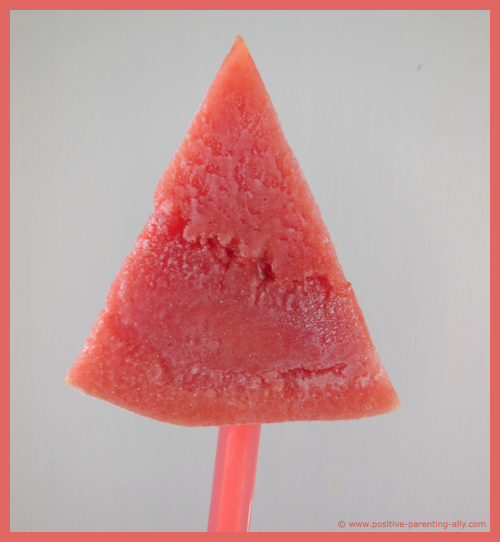 Just take a watermelon - any melon will do, really. Cut the melon into ice lolly sizes. Stick a stick in them and throw them in the freezer. 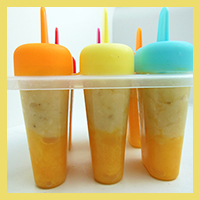 And now you have several easy and healthy frozen snacks for whenever your kids feel like a sweet treat. 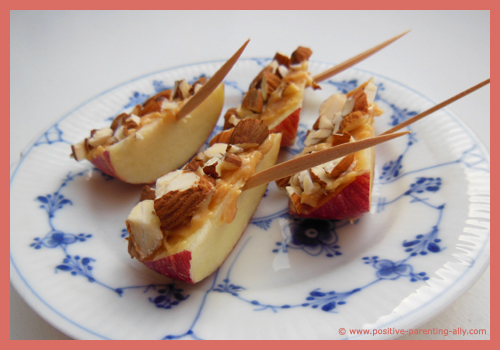 This simple healthy snacks for kids recipe is so delicious and filled with both healthy carbs, fat and protein all in one go: You've got the apple as carbs and almonds and peanut butter as both protein and fat. Cut your apple into boats. With a knife, you smear peanut butter on one side of the boats. Chop up some almonds and dip the peanut butter side in the almonds. When it comes to easy and simple snack recipes, they don't get more easy than these crunchy cold bananas. 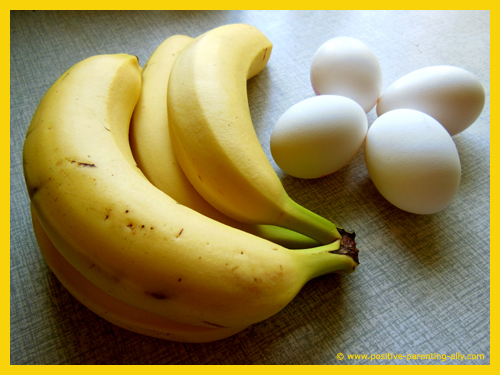 Find a banana or two, peel it/them and cut it/them in half or quarters. Chop up some almonds or nuts. 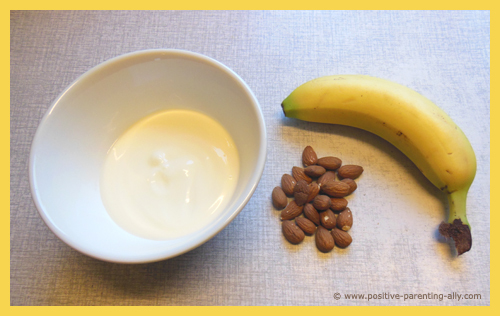 Cover the bananas in yogurt and sprinkle on the chopped up almonds or nuts. Throw them in the freezer for two hours or so. 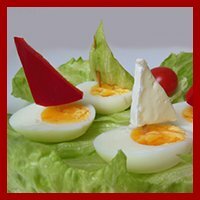 A cool, healthy snack your kids will love! This home-made, healthy snacks for kids recipe is an ideal substitute for fat-laden, sugar-filled alternatives such as ice cream and lollies that your kids may be asking for when the weather is warm. This is probably the oldest trick in the book when it comes to getting your children to eat healthily, but they do say the oldies are the best, and I tend to agree. Simply select a variety of raw fruits and vegetables and arrange them into the face of your choice, if your kids are old enough, ask them to do it themselves and see what they come up with. 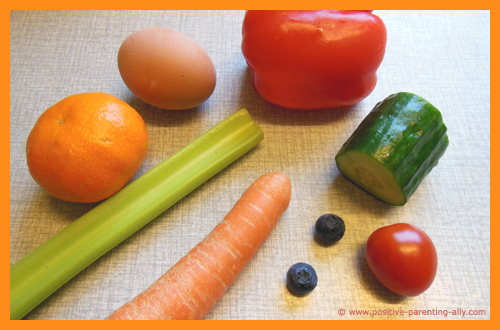 I have found that eggs make excellent eyes, a piece of bell pepper makes a lovely mouth, celery is ideal for ears, and some peeled carrot do wonders for hair. 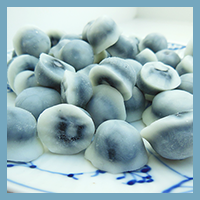 This may be one of the oldest healthy snacks for kids around but it really does work. 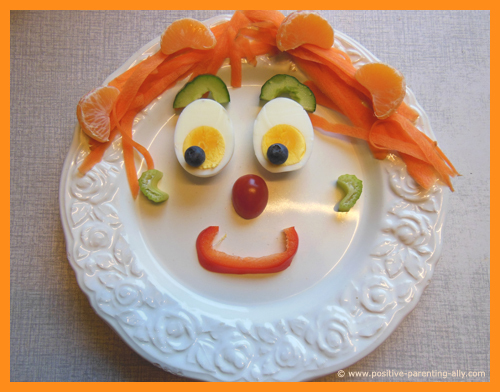 If you want, you can swap around the fruit and vegetable combinations regularly to make the dish new and exciting, and encourage your kids to get creative making their own faces. This example of kids snack recipes for banana pancakes were given to me by a dear friend of mine. And the recipe is the easiest to remember ever! One egg for one banana ... and that's it. When it comes to healthy snacks for kids it really doesn't get any easier than that. Just put it all in a bowl and mix it together. Fry them on a pan with a bit of healthy olive oil. 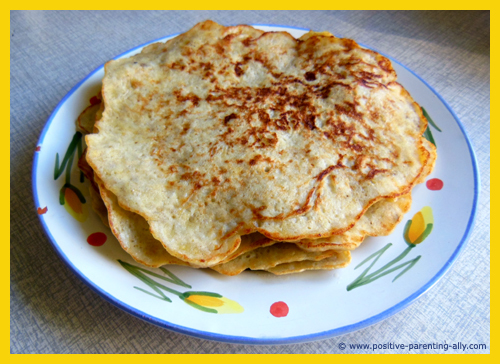 And now delicious sugar free banana pancakes that everybody in the family will love. 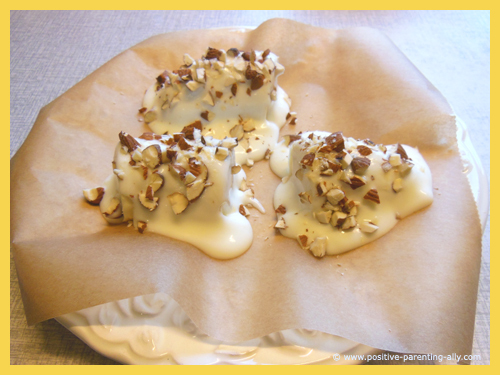 This ants on a log recipe is ideal for older kids, who can create their own snacks or at least know to go in the fridge to help themselves after school. 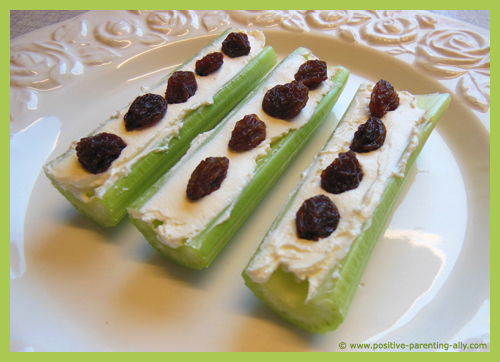 Simply cover celery sticks with cream cheese. Pop a few raisins on the top. 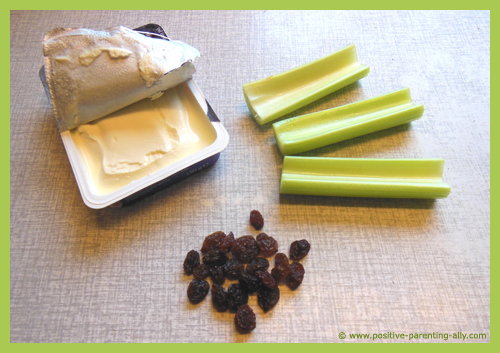 Chop your celery into bite size pieces, a tiny bit of cheese and a raisin and you are good to go. 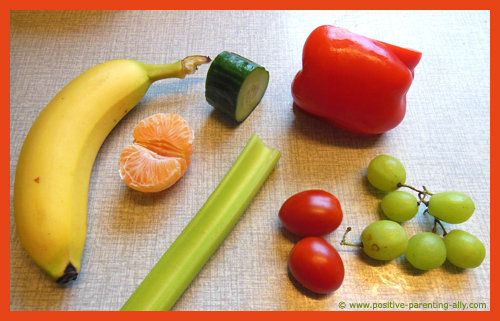 Or if your kid is not particularly into celery (it is an acquired taste, I'll admit) replace the celery stick with a carrot cut into two halves along the longest side. Most certainly more nutritional value than a packet of chips or a plate of cookies. 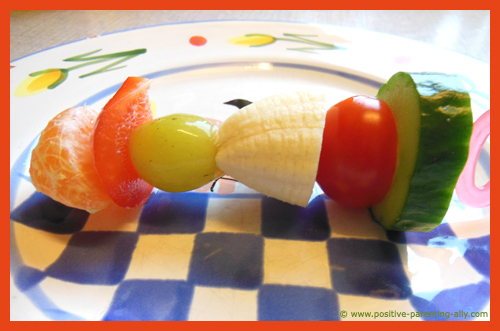 Kebabs with vegetables and fruits are great snacks for toddlers. For this recipe, I use the same plastic sticks I normally use for making ice lollies rather than real wooden kebab sticks. Wooden kebab sticks are pointy and not a very safe choice with smaller children. If you don't have ice lolly stick or find that those you have are not well-suited for the job, you may consider chop sticks. Chop sticks are an excellent choice as well as they have rounded, non-sharp ends, too. According to the American Government website - Let's Move, children are more likely to eat food that is easily available therefore, replacing cookie jars with fruit bowls or plates with cut out vegetables is a good way to improve your child's diet. You can also add cubes of cheese and grapes, to make it interesting and different now and then. 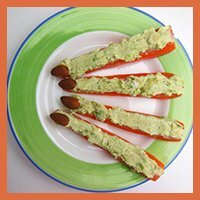 This easy home-made healthy snacks for kids recipe can easily be changed to involve other things, such as bell peppers, tofu, pickled onions or carrots, if your child is into some of those things. An easy healthy dinner for kids is a more involved take on the kiddie kebabs recipe. Simply add bell pepper chunks, squash chunks, mushrooms and tofu pieces to a kebab skew and brush lightly with olive oil. Pop them into an oven on medium heat for around 12 to 16 minutes or until they have begun to brown. 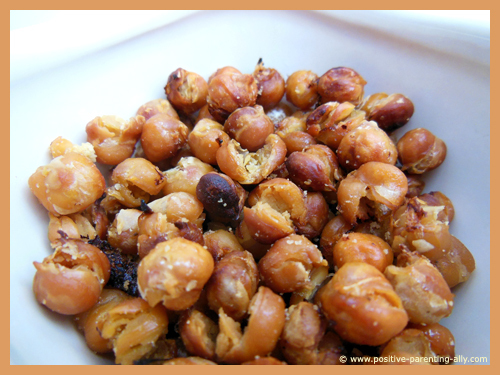 My kid loves these with rice and peas, which altogether makes for a healthy dinner for everyone. According to the American Dietetic Society, until recently it was recommended that parents did not allow children under three to eat nuts. However, scientific research into nut allergies and the like has revealed that eating nuts from an early age can actually help build an immune system to any such allergy. Are we there yet? I'm hungry! Most parents can relate to being stuck in a car, or worse public transport, with their children when hunger strikes. According to the Kids Health website, children requesting food while out and about are more likely to be given fast food or some other junk food snack in a bid to keep them happy as quickly as possible. However, with a little organization and forethought it is possible for you to create healthy snacks for kids that are easy to transport wherever your child is going. 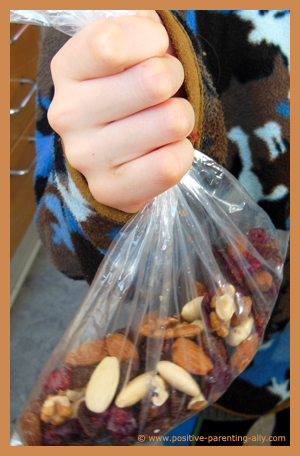 An easy healthy snack recipe for kids requires nothing more than dried sultanas and cranberries, almonds and walnuts thrown together in a sandwich bag. This simple snack can be prepared literally minutes before you hit the road, making it ideal for parents who have little spare time. It is amazing what you can do with a couple of slices of wholegrain bread, a lean piece of meat and a sharp knife, or even better, a cookie cutter. 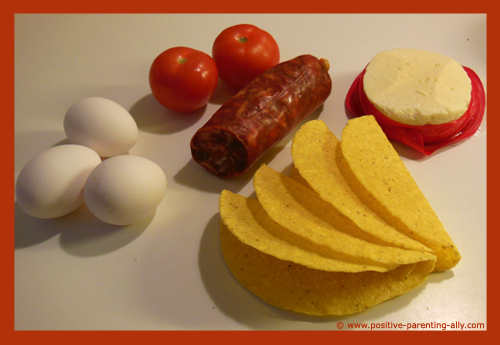 Healthy snacks for kids should be creative and what is more creative than a sandwich shaped like a dinosaur, or a star. Or just another funny shape coupled with a funky pair eyes, like you see in the picture above. Simply make the sandwiches as you normally would and then press the cookie cutter in to the sandwich to get the shape - or you can just use a sharp knife - that worked for me. You can use sandwich bags to keep them fresh or better still, use a packed lunch box and add slices of apple and cucumber. 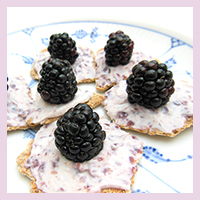 A quick, easy snack idea that will cover all the bases. Don't forget!! Keep the drinks healthy too - replace sodas sugary drinks, even fruit juices, with plain water. 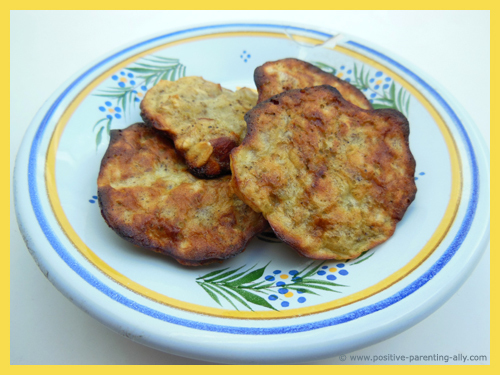 This one of healthy snack recipes for kids is super simple and also ideal for children who may be gluten intolerant and therefore looking for alternatives to bread. 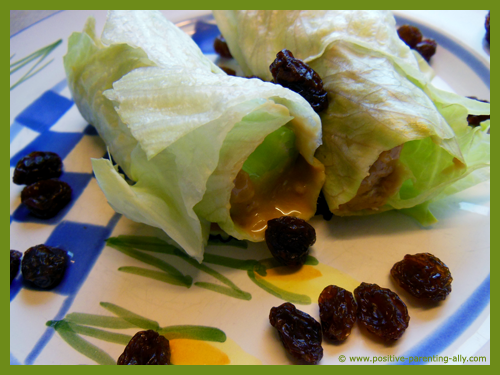 Simply cover a medium-sized lettuce leaf with peanut butter or cream cheese. Add a celery stick, a couple of sultanas or raisins and wrap up neatly. These taste lovely, and my kid sometimes requests these for his school dinner meaning it is also a healthy lunch idea for kids, too. 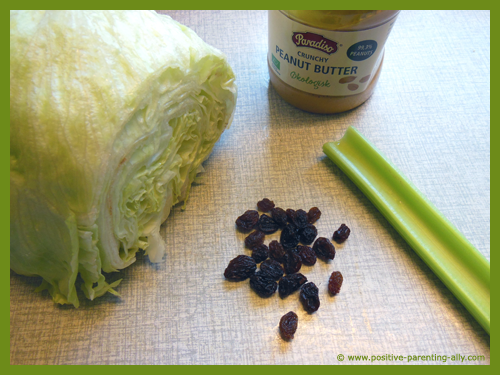 Of course, you can mix up what you put inside the lettuce leaf, depending on your child's favorite foods and tastes. 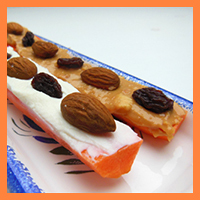 This kind of easy snacks for kids is a really delicious treat and it is so easy to make that you wouldn't believe it. 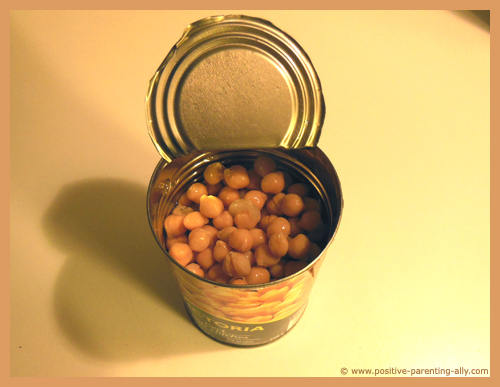 Open a can of chickpeas. Spread them out on a baking sheet with a little bit of salt. Put them in the oven (180-200 degrees Celsius/350-400 degrees Fahrenheit) and keep an eye on them until they have gone golden and crispy. These healthy snacks for kids are really, really lovely. My son loves them. You can bring them with you in a plastic bag for a small snack if you're going somewhere, or you can put them in a bowl on the sofa table for your kids to nibble on now and then. Toddlers are, by their very nature, strong willed, stubborn and determined to be independent. This means, that even the best intentions when it comes to their diet can be thwarted. How many of us can relate to giving in to a screaming toddler who isn't interested in the apple pieces but instead wants the cookies. Top children's hospital, The Westmead, believes parents should listen to their toddlers when it comes to WHEN they are hungry and HOW MUCH they want to eat but when it comes to a nutritious diet, we really shouldn't let them dictate to us. Fortunately, there are strategies you can try with your toddler that will not only help introduce new foods into their diet but it will also help them select the healthier options, too. Appeal to not only a toddler's sense of fun but also their sense of growing independence by making creative snacks they can feed themselves. According to the Westmead Hospital, almost 50-percent of the calories consumed by toddlers are so called "empty calories". These are calories that provide no nutritional value to your child, leaving your child feeling hungry quicker, lethargic and generally grumpy. According to the Westmead hospital, a toddler's snack should not last any longer than 30 minutes. Any longer and you risk losing their interest or dulling their appetite for the main meal. All children like chips, sadly these are a prime example of empty calories as they are so laden in unhealthy fats (too much omega 6 to omega 3 ratio, for one thing), offer no nutrients whatsoever and eaten in large amounts will only lead to weight gain. The sodium content is also high in chips, which is worrying for children - small children in particular. Kale, a form of cabbage, is rich in nutrients and is commonly referred to by dieticians as a super food. 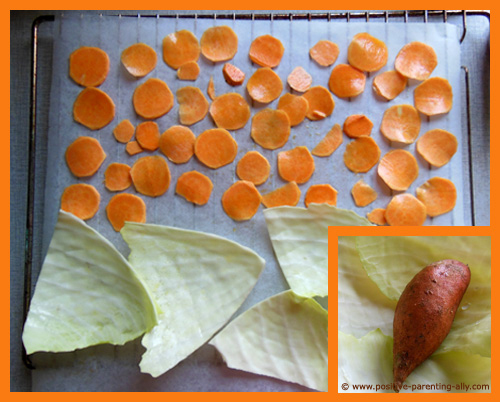 Simply place several leaves on a baking sheet. Cover with olive oil and bake in your oven, on 250 degrees, for around 10 minutes. Keep a close eye on them all the time because all of a sudden they just turn black. The result, beautiful kale chips your kids will love, especially the younger ones who will marvel at the green chips. 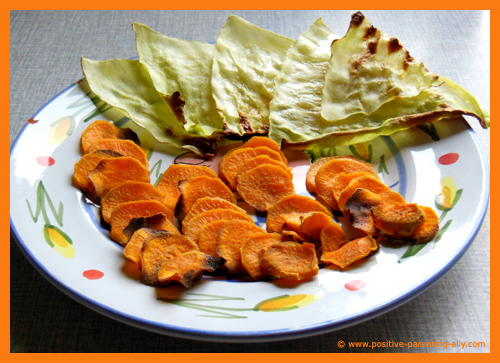 This healthy snack also works with sweet potato, if you want to offer some variety. Be sure that you cut the sweet potato in relatively even slices, so they go crisp at the same time. Looking for some sugar free cookies to put in a jar that you can let your kids eat whenever they want to and still have a clear conscience? Then this idea might be right up your alley. 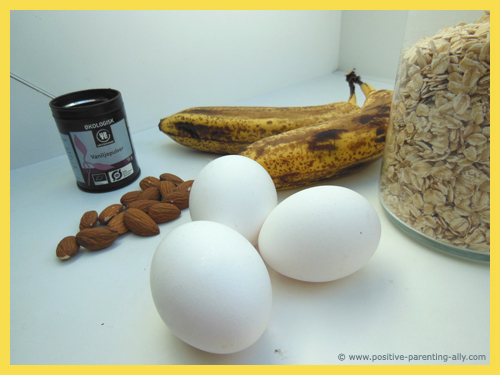 All you need are some eggs, bananas, oats, almonds and a bit vanilla powder, if you have some. Put them on a baking tray and put them in the oven (180-200 degrees celsius/350-400 degrees Fahrenheit)until they are golden. 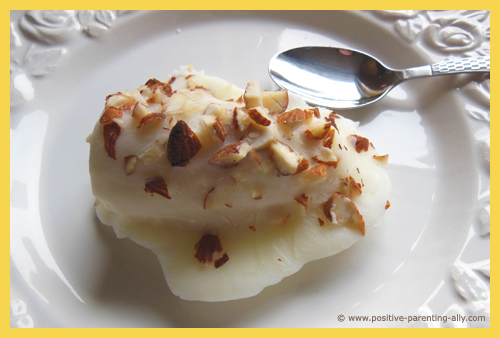 And now you'll have some really healthy sweet treats to eat at home, in the car or on the bus. According to the Westmead Hospital, a child should have three to four servings a day of vegetables - with one serving being roughly half-a-cup in size. A child's daily allowance should also include two servings of fruit - with a serving equating to roughly half a banana or one plum - natural fruit juices are also counted in your allowance meaning you can get one serving in a drink if needs be. Even with the best healthy snacks for kids, getting the recommended allowance into your child's diet every day can be a challenge. It does mean however, that as well as healthy snack recipes, you should incorporate healthy meals into your child's diet, too. According to the Kids Health website, the most important meal of the day for adults and children alike is breakfast. As well as giving them the best possible start to the day, it also provides sufficient fuel to get them through to their next meal. Unfortunately, breakfast is often the most challenging to execute when it comes to kids, what with getting them ready for school or daycare. 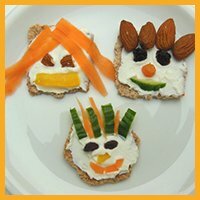 If coming up with creative healthy snacks for kids can be a challenge, then what about healthy meals? Here are a few ideas as to how to make a healthy breakfast, lunch and dinner that hopefully will suit all individuals in your household. A simple yogurt and nutty fruit mix can add an appealing spark to a normally boring breakfast. 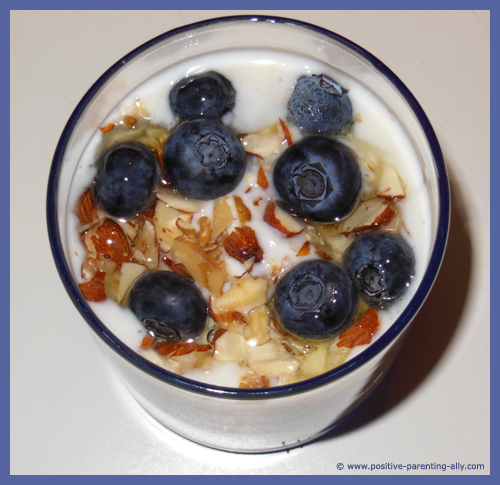 Below you'll see a healthy, colorful yoghurt (plain, no sugar) mix with chopped up almonds and blueberries. I also added a bit of honey as a natural healthy sweetener. Appeal to your kid's natural love of tacos by filling one with scrambled egg, chopped tomato, a bit of chorizo sausage and topping it with cheese. Don't be too afraid of adding protein and fats for breakfast. Ever since I included eggs as a standard in both our breakfasts, we can last much longer without needing to eat again and our concentration and ability to focus for longer has really improved, and we both simply feel much fuller in a more comfortable way. First chop up the chorizo in tiny bits and then fry them until they become a bit like bacon. Then add the chopped up tomato and the eggs and perhaps a bit of cream if you like. 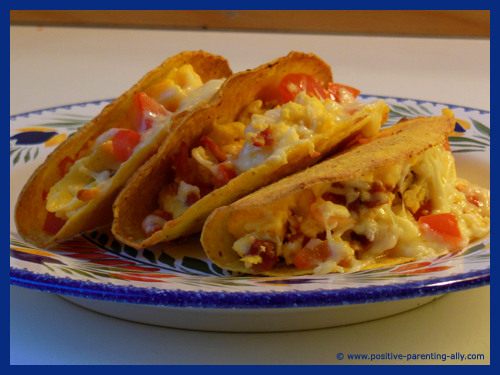 Put the tacos with their content in a preheated oven - don't leave them there for more than a few minutes tops. And then, that's it! I'll admit they do look kind of 'fat' but they are really delicious and have lots of healthy proteins. My son loves them and the tomatoes just give them that bit of freshness needed. Not only is this a healthy breakfast, egg is one of the recognized "brain foods" - ideal for little people heading out to school. While the scrambled eggs do take time to make, if your children are old enough encourage them to make their own, as I do with my own son. According to the University of Illinois, most children are ready for a snack around 11.00 am. This means, ideally you should aim to give your children lunch around 1pm. Use the healthy snacks for kids recipes to ensure their mid-morning snacks contains some of their daily vegetable allowance and you will have a little more leeway when it comes to healthy lunch ideas. 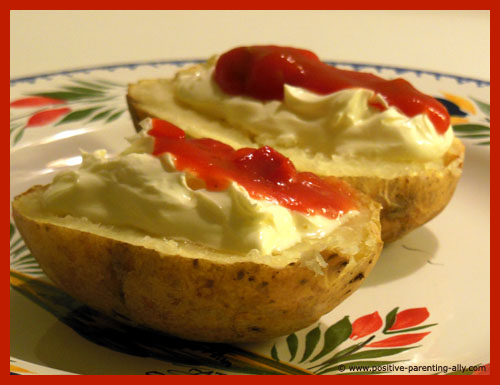 A simple, medium-sized potato baked in the microwave or oven depending on your time allowance and top with sour cream and salsa. Yum! You can choose to cut the potatoes in half before or after they go in the oven. 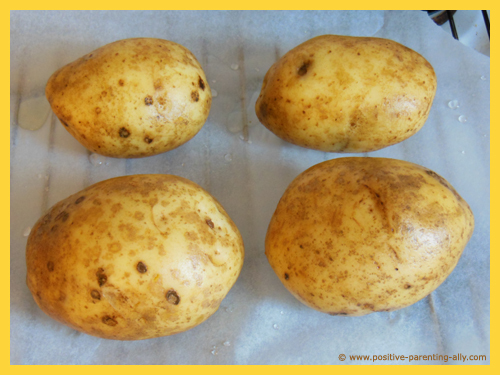 The advantage of doing it after is that it will be easier for your kids to press down the spoon into the potato - the downside, well, it takes longer to bake in the oven. This snack was surprisingly delicious. My son said they looked sort of okay, but tasted MUCH better than they looked. We used a medium hot salsa which worked fine because of the sour cream to take to top of the spiciness. This easy recipe calls for fresh, not tinned, apricot halves that you can fill with either cottage cheese or cream cheese. 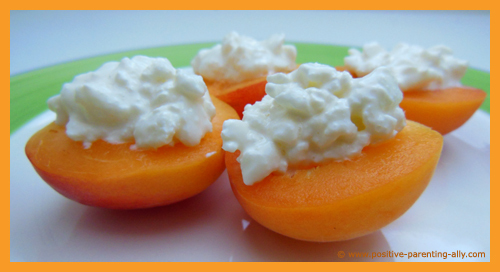 If your children are not cheese lovers, you can fill the apricots with soft tofu or hummus. And to make a full lunch of it, you can add an egg and a bit of bread on the side. When it comes to encouraging your kids to eat healthily, the best role models you will find are yourself. And not only are children prone to mimicking what you eat, they also quickly sense if you are not honest about what you like yourself. So the best thing to do is to make something that you yourself really enjoy eating. Interesting Facts about Healthy Eating for Kids No. 7It Isn't All About The Food... Researching the best healthy snacks for kids, as well as potential healthy meals for the family will have little effect if you do not keep an eye on your child's portion size. According to the Kids Health website, you should wait until your child expresses hunger before giving them a snack. While it pays to have a fairly static main meal routine, snacks should only be given when your child is hungry and not according to a clock. The website goes on to remind parents that all children are different and you should only offer them enough food to make them comfortably full. Offering a toddler the same portion size as an older child will only lead to over-eating, which is just as detrimental as eating the wrong types of food. Most people will be familiar with meatballs and while in ordinary circumstances it isn't the necessarily healthiest meal around - but there are ways around this. Firstly, it is essential you use good quality minced meat and then you can add tiny pieces of chopped up or shredded vegetables (I like to use squash, carrots and onions. ), a bit of oats and an egg to the minced meat. Rather than frying off your meatballs, you can choose to bake them in a medium-heated oven for 20 minutes or until they have browned. Cover with your desired tomato sauce (I also stuff the sauce with vegetables often the same ones as I put in the meat balls) and bake in an oven proof dish for an hour before serving with spaghetti. This healthy dinner recipe is easy to make and is a firm favorite with my whole family. Meal Plans - Sit down every Sunday evening and make a week's worth of meal plans for your children and family as a whole. Include healthy snack ideas and have a calendar on hand so you can ensure the really easy healthy snack recipes are reserved for your family's busiest days. Not only will this help you stay organized through the week, it will also cut down on the amount of food you waste. 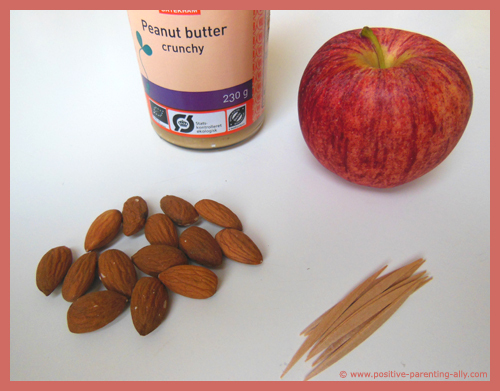 Prepare in advance - Most of the healthy quick snacks for kids I have included here and in other parts of my website can be prepared in advance. 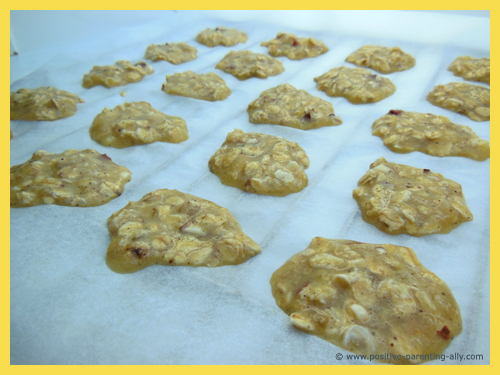 Making batches of snacks when you have time and keeping them refrigerated or frozen means they can be eaten on days when you may be struggling for time. For instance, I pretty much always have frozen bananas on a stick in the freezer. Consider not taking the kids shopping - According to the University of Illinois, parents are more likely to pick up unhealthy snacks and foods for their kids if they have them with them when they are grocery shopping. Instead, order your shopping online or go to the store at a time when you can leave the children at home. Don't give up - When trying new healthy snacks for kids, don't throw in the towel if your child refuses to eat it the first time they try. According to the Westmead Hospital, most children take at least ten tries of a new food before deciding whether it is for them. That means that while those kale chips were a washout on the first attempt they could become a firm family favorite in no time. My Eye Opener: The Experts Say "The Problem Isn't the Meals but the Unhealthy Snacks In Between!" With today's dire economic climate, more and more parents are working outside of the home. This means less time in the family home and, as a domino effect, less time to concentrate on issues such as healthy eating. I mean, as long as your kids are not eating burger and fries every evening that's okay right? To a certain extent yes, I understand more than most how difficult it is to ensure your children, and the family as a whole eat healthy. However, statistics referred to by the Kids Health website seem to reveal that it isn't the actual meals children eat that are the heart of the problem, but rather the snacks they eat in between that are a cause for concern. So what can we as parents do, when a lot of the time we are busy trying to ensure the bills are paid and the family is kept happy and healthy. Easy healthy snacks for kids do not have to be time consuming, they most certainly do not require you to toil away in the kitchen for hours. In fact, many of the recipes I have found about healthy snacks for kids and put together here can be prepared in advance - meaning older children can just help themselves. If you believe that your child's diet has been less than impressive up to now, it is never too late to change. In fact, the older your child, the more able you are to convince them of the major health benefits of watching what you eat. Older children can also be involved in choosing the types of foods they eat, you can even challenge them to find the healthiest easy snack recipes. Most parents will turn to fast foods or convenience meals when time is stretched or finances are restricted but if you look at the healthy snacks for kids I have on my website, along with the advice I have researched and provided you can make permanent changes for the better.